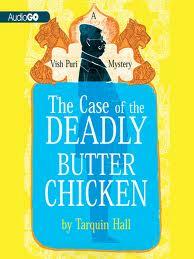 Today sees the publication of the third Vish Puri novel, The Case of the Deadly Butter Chicken. Tarquin Hall Himself will be signing it at the Poisoned Pen Bookstore in Scottsdale this evening. You should go. If by malign fate you have missed this fabulous PI series set in modern day India, here is my review of the first in that series. 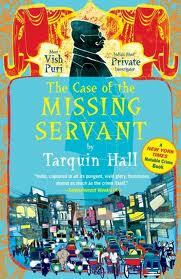 Tarquin Hall’s The Case of the Missing Servant is a different kind of crime novel, and not just for its vibrant street view of modern India. Vish Puri is no loner PI in the traditional Sam Spade mold. He’s the proprietor of Most Private Investigators Ltd., a thriving concern. He has employees. He has an excellent reputation. He has high-placed sources. He has a wife, beside whom he wakes up every morning. Of course, one of those mornings someone does try to shoot him off his own roof. Fortunately, one of his prize chili plants takes the hit for him. It isn’t the first time someone has tried to kill Puri. It’s the twelfth. On six occasions, his enemies had tried shooting him; twice, they’d attempted poison (once using a samosa laced with arsenic); and during the Case of the Pundit with Twelve Toes, a hired thug had tried to force Puri’s car over the edge of a hairpin bend on the road to Gulmarg. The most ingenious attempt had been orchestrated by a cunning murderer (a naturalist by profession) working in Assam’s Kaziranga Park, who had secretly sprayed Puri’s clothes with a pheromone that attracted one-horned rhinos. The closest anyone had come (not including the three rhinos, who could move surprisingly quickly) had been a criminal hijra who had pushed a pile of bricks off the top of a building into an alley in Varanasi where Puri had been walking. You would think that all Puri’s time would be taken up in just staying alive, but you would be wrong. Puri is hired to discover who is spreading vicious rumors about Ajay Kasliwal and a missing servant named Mary. A crusading attorney who has made himself a thorn in the side of India’s corrupt legal system, Kasliwal is a target of opportunity for everyone who wants things to stay as they are, and that’s pretty much everyone except Puri, and not just because he’s paid for it, either. The road led past the Jal Mahal palace, beached on a sandy lake bed, into Jaipur’s ancient quarter. It was almost noon and the bazaars along the city’s crenellated walls were stirring into life. Beneath faded, dusty awnings, cobblers crouched, sewing sequins and gold thread onto leather slippers with curled-up toes. Spice merchants sat surrounded by heaps of lal mirch, haldi and ground jeera, their colours as clean and sharp as new water-color paints. Sweets sellers lit the gas under blackened woks of oil and prepared sticky jalebis. Lassi vendors chipped away at great blocks of ice delivered by camel cart. In front of a few of the ships, small boys, who by law should have been at school, swept the pavements, sprinkling them with water to keep down the dust. One dragged a doormat into the road where the wheels of passing vehicles ran over it, doing the job of carpet beaters. …rows of male typists sat at small wooden desk bashing away at manual typewriters. The tapping of tiny hammers on paper punctuated by the pings of carriage bells was constant–the very sound of the great, self-perpetuating industry of Indian red tape…A rate of ten rupees per page was charged for this service, an unavoidable fee given the court’s stipulation that all official documents should be typed (and one exploited to the full by the typing mafia, who ensured that there was not a word processor in sight). …unofficially, it was also Elizabeth Rani’s remit to listen patiently to Puri’s expositions and, from time to time, give his ego a gentle massage. There is a glossary at the back, too, so you know exactly what* Puri’s client, Sanjay Singla, calls Ramesh Goel, a man who is soon to become Singla’s daughter’s ex-fiance. 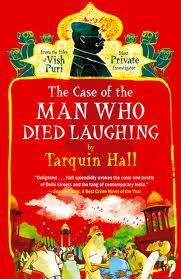 A fun, you-are-there read, and the second in the series, The Case of the Man Who Died Laughing, is now available. It would be really nice if “A Fine and Bitter Snow” was available in Itunes/iBooks for those of us outside USA. There is not in Kindle edition, its not on Audible.com, the iBooks is USA only. I wonder why this book is different? Sorry to be off topic, the contact page says to leave a comment, but comments are closed on most pages. Thanks for posting, Miriam. Kates 10-18 are with a different publisher than Kates 1-9, but I am told will be out in e in all Commonwealth countries by the end of the year. Stay tuned, I’ll let everyone know when they are available here on stabenow.com, on Facebook, Twitter, Goodreads, etc. Thanks Dana, I invariably love your book recommendations (have now read every book written by Kerry Greenwood) and the Puri books are great, and so INDIAN. And the food! Am going to try Molly Gloss next. Is there food in her books? I don’t remember food, Gloria, but Hearts of Horse is a darn good book anyway. Wow! Hall is an outstanding storyteller, isn’t he? Thanks so much for the book reviews! Professional book reviewers can’t be relied upon so I appreciate recommendations from friends, librarians and writers. I’ve finally been able to read “The Case of the Deadly Butter Chicken” – my hold on it at the library finally came up! Mummy’s experiences after the Partition were certainly an eye-opener for me and validate, yet again, the old saw that the “winners write the histories” (and women are frequently the losers). I looked it up in Wikipedia and, yes, that really did happen. Thanks again for your book reviews & recommendations! I’m embarrassed to say that I haven’t read it yet, Ann, but your mention of recipes is going to send me hot-foot to my overloaded to-read shelf. Thanks for the nudge! And delighted to hear you found the bread recipe useful. It’s a really simple one, all that is really required is patience.